Krocodile Kore is a large volcano with an entrance shaped like a Kremling head. It appears in the centered crater lake of the Lost World in Donkey Kong Country 2: Diddy's Kong Quest. Its interior appears to be a shrine, featuring artifacts such as ancient statues and weaponry. Krocodile Kore is the power source of Crocodile Isle, which is caused by a geyser of pink and blue energy emitting out of its volcano crater. The head is originally closed, but its mouth opens after Diddy and Dixie Kong complete every level of the Lost World. This allows the Kongs to enter the location where they have their second and final battle against Kaptain K. Rool. If the player used the secret in the very first level of the game to get all 75 kremcoins, players can finish this level before the actual first boss battle. Doing so will reset lives and coins but the rest of the game can still be played afterwards. When the Kongs enter the location, they immediately encounter Kaptain K. Rool. He is drenched from landing in his swamp, and he shakes off some seaweed and empties fish from his blunderbuss. The battle is significantly different from K. Rool's first match in The Flying Krock. In Krocodile Kore, Kaptain K. Rool fires a very long onslaught of spiked Kannonballs and purple gas clouds, all of which the Kongs must dodge. The last object that K. Rool fires out is a barrel, which contains a regular Kannonball. Like the previous battle, K. Rool attempts to vacuum the Kongs toward him via his blunderbuss. The Kongs must pick up the Kannonball and toss it in his blunderbuss, which he then fires out rapidly. K. Rool is only defeated from a single hit in this battle. Upon firing out the Kannonball, Kaptain K. Rool's blunderbuss explodes, hurling him into the air. K. Rool lands on the power source, where he gets stuck. He blocks the energy flow, which starts an earthquake. The power source explodes, and the entirety of Crocodile Isle is destroyed. The Kongs and K. Rool manage to escape as the island sinks underwater. 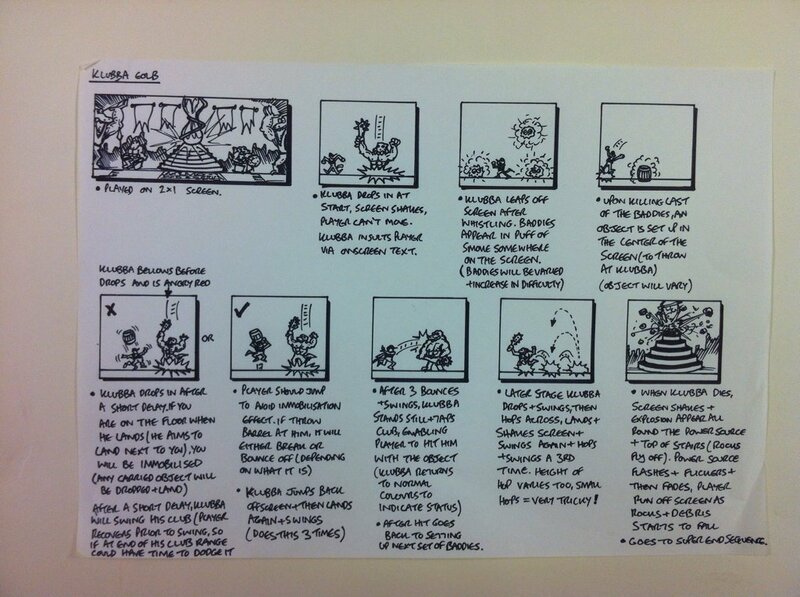 According to a drawing by Gregg Mayles, Klubba was planned as the final boss, in an encounter similar to Kudgel. Kaptain K. Rool eventually became the boss of Krocodile Kore. 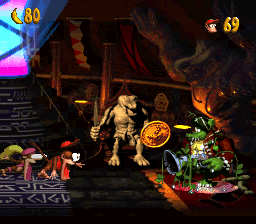 The events that transpire after defeating the boss of Krocodile Kore were kept—the villain flies into the power supply, the area crumbles, and the Kongs retreat away from the island. This page was last edited on March 10, 2019, at 09:14.